Designing and decorating a bathroom is usually considered a major domestic challenge. You need to arrange plumbing, decide where the fixtures go, and brainstorm storage solutions. And it doesn’t stop there. The right colours, lighting, materials and decorative elements have to be chosen, so that your bathroom is comfy and soothing. 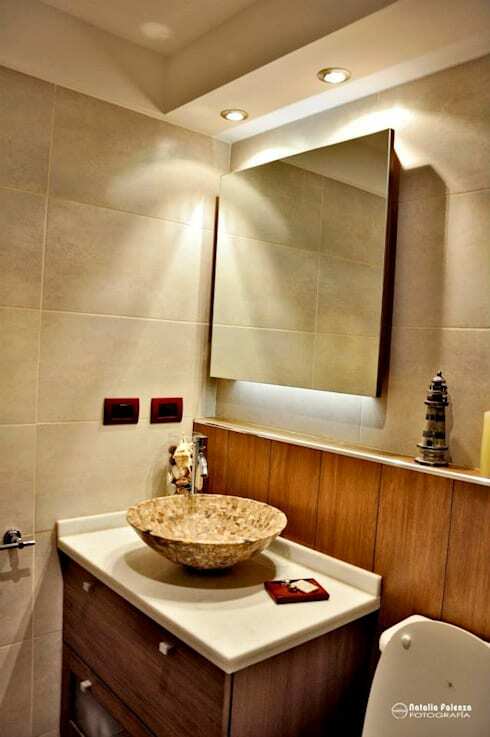 After all, your bathroom is where you truly get some 'me' time, and should help you relax and rejuvenate peacefully. So, to make yours inviting, visually appealing and downright spectacular, check out these 6 cool decor ideas. From using mirrors and timber to incorporating curtains and shelves, your bathroom will only need a few simple tweaks to bring it to life! 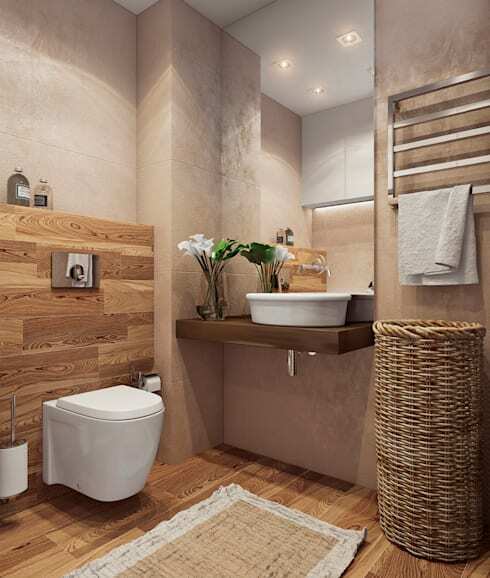 Wood can lend tons of warmth to your bathroom, as well as making it look elegant. Use it for the floor or as wall cladding to ensure a rustic but cosy atmosphere. Get the wood treated so you don’t have to worry about the humidity getting to it. Take a cue from this beautiful bathroom designed by the interior architects at Angelina Alekseeva. Introduce large mirrors, glass panels or windows to your bathroom to produce enticing optical effects. 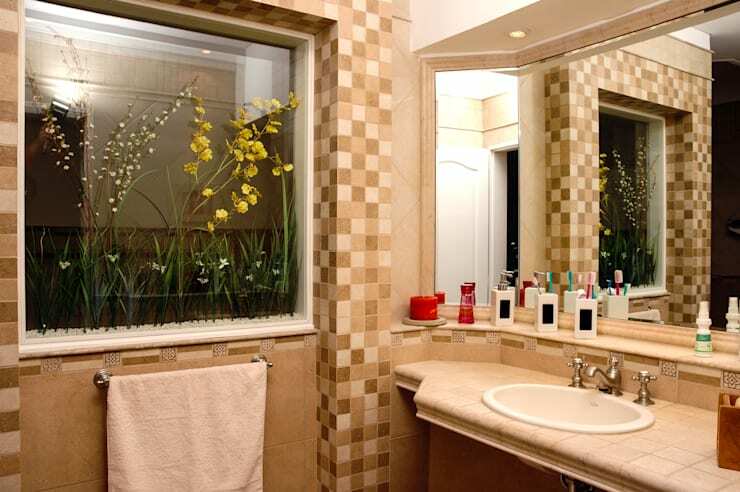 By using such materials, you'll be able to visually enhance the size of your bathroom too. Play around with unique shapes if you want a fancy atmosphere. Pick a beautiful shower curtain to bring a panel of colour and texture to your bathroom, making sure it complements the tone of the walls and fittings. 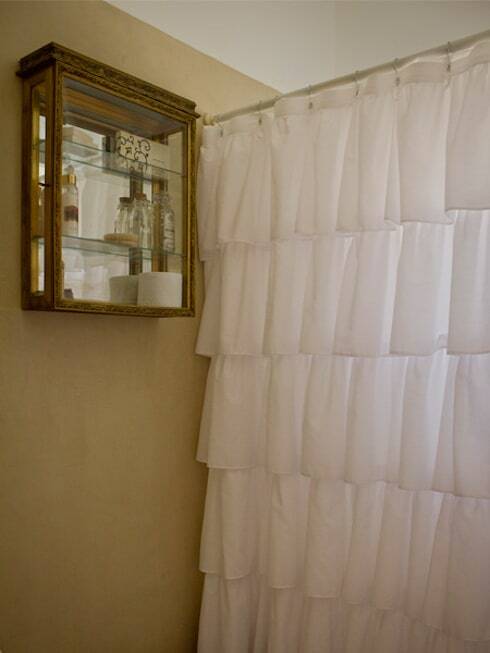 The layered white curtain shown here goes very well with the wooden shelf and vintage jars, for instance. Go for neat wall-mounted shelves without shutters or with glass shutters to display the pretty bottles of gels, oils and shampoos. Clean towels and makeup products can also be stored in these. These shelves are not just functional, but they will add to the decor as well. A creative sink, perhaps made from stone or copper, will make your bathroom a truly stylish space without compromising on functionality. A quirky shape or unusual colour can do the trick as well. 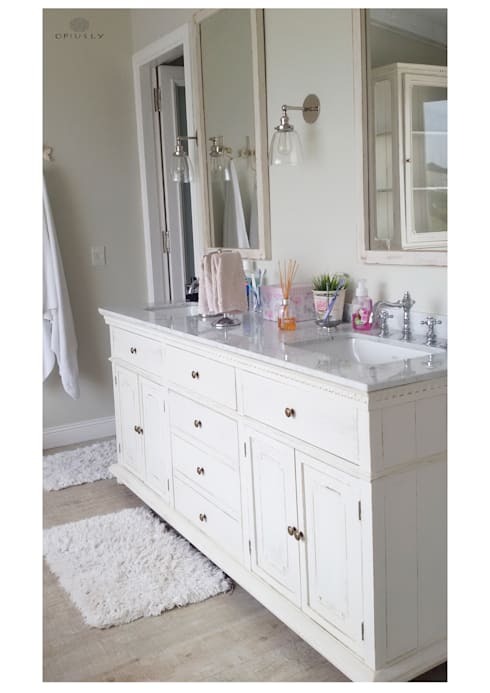 A neat and smart vanity counter like the one shown here can store all the things you don’t want to see, such as cleaning supplies, dirty laundry or dated toiletries you need to get rid of. 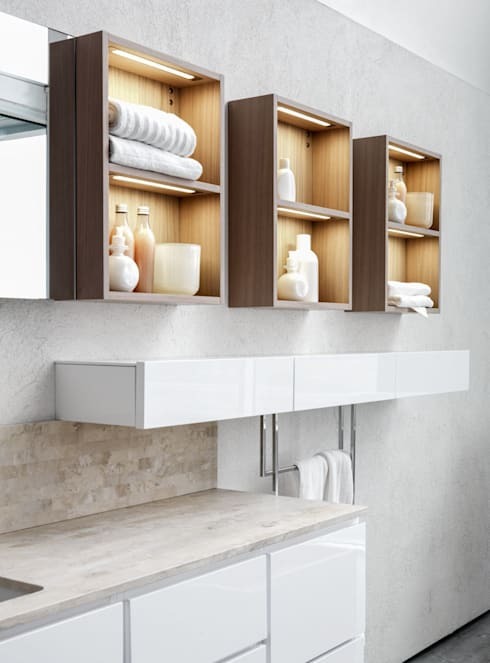 This furniture piece will keep your bathroom clean and organised. Which of these bathroom ideas do you like the sound of?